Posted Thursdays: Aug. 28, Sep. 4, 11, 18, 25, Oct. 2, 9, 16, 23, 30 ....or weekly until the first monarchs arrive in Mexico! Large numbers of monarchs have now reached Mexico's overwintering region. 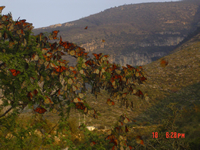 By November 2nd, the tops of fifteen trees at the El Rosario sanctuary were covered with monarchs. How many monarchs will make it to Mexico? How large will this year's overwintering population be? Make your own prediction. We'll have the actual results when Journey North begins again in February. Please join us! The migration pushed southward into Texas in two clear waves during the past week. The largest roost of the season appeared when the first wave hit northern Texas, with up to 25,000 monarchs. High-flying monarchs dropped down near the Mexican border with the second wave. Find out how high monarchs fly and how high we can see them. We are tracking migration based on visual observations, so these questions are important! A cold front moved across Oklahoma on Monday and a clear wave of monarchs moved with it, advancing perhaps 300 miles. Monarchs came down to rest Monday night and one woman recorded all the details. Two scientists explain how monarchs migrate with the wind. They couldn't get to Mexico without it! Also, we invite people across North America to tell about their habitat projects for monarchs. Masses of monarchs traveled along Canada's northern Great Lakes shores last week. The warm fall weather gave them time to travel before cold temperatures trap them. Migration along the Atlantic Coast and the Appalachian Mountains is picking up, too. Our migration map is beginning to reveal the pathways monarchs travel on their way to Mexico. What stories do two tagged monarchs tell about monarch migration? Hurricane Ike showed how hurricanes destroy human property and lives this week. In what ways could such a powerful storm affect the monarch population? In addition to the hurricane, monarchs were avoiding something else this week, can you find the clues? Also, a tagged monarch was found! What do its travels tell you? Look at the migration map and you can plainly see, the monarchs are heading toward Mexico! They are entering Nebraska and Kansas in large numbers now, and people in Iowa are reporting peak conditions. When you report your monarch sightings, tell us how many monarchs you saw per minute (or per hour). This lets us determine where the migration is strongest. How many monarchs can you count in one minute? Practice with this week's activities. Monarchs rested last week in Minnesota, Michigan, Wisconsin, and Iowa during their long migration to Mexico. With over 1,000 miles left to fly they formed large roosts and waited for winds to carry them southward. Only 12 roosts have been reported this fall compared to more than 80 last year at this time. Are these true signs of a small population? Will this winter's population in Mexico will be smaller than last year's too? Also: Can you identify a monarch butterfly? The migration to Mexico is underway! Please help track the monarch's journey. Watch for monarchs that are flying, resting and refueling. But where are the monarchs? Last fall, 45 overnight roosts had been reported compared to only 3 so far this year. Meet a slow-growing monarch this week and explore climate connections. Teachers: Get started with a guided tour for using Journey North in your classroom.